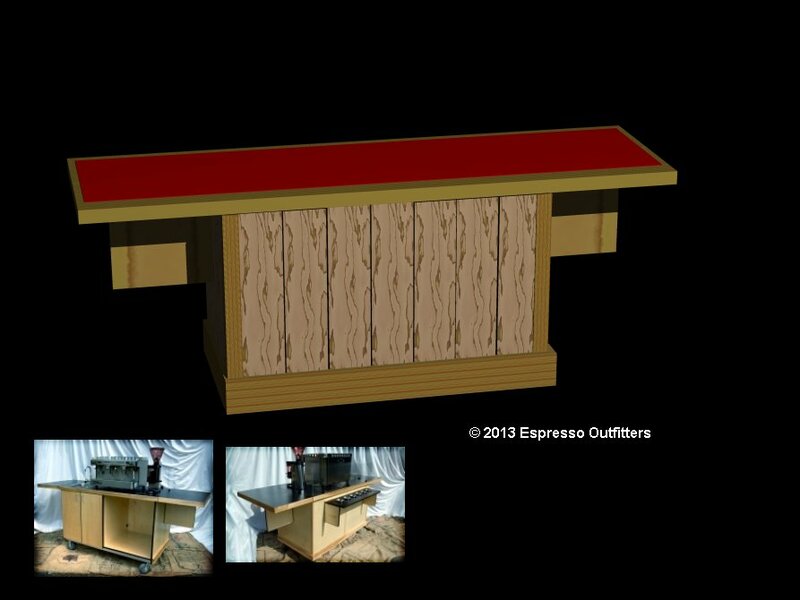 Espresso Outfitters, espresso carts and espresso cart, as well as food cart manufacturers. 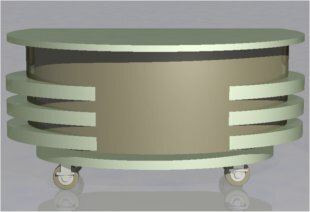 The concept carts are part showing what can be done and part showing what has been done in the more exotic or non mainstream designs. 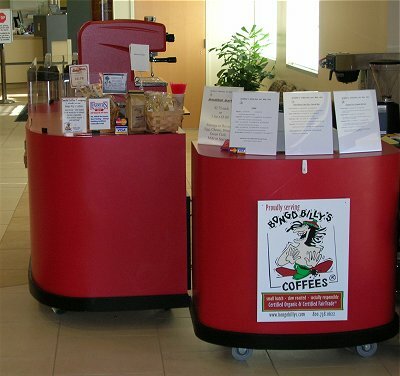 Some started out in this section that went onto becoming real espresso and food service carts. We are showing what can be done and if someone opted into having something unique or specific for their application we can create it in the digital world to give people a virtual view of it no matter how elaborate they require. Options and features shown can be incorporated, if it can be dreamed up, it can be done. 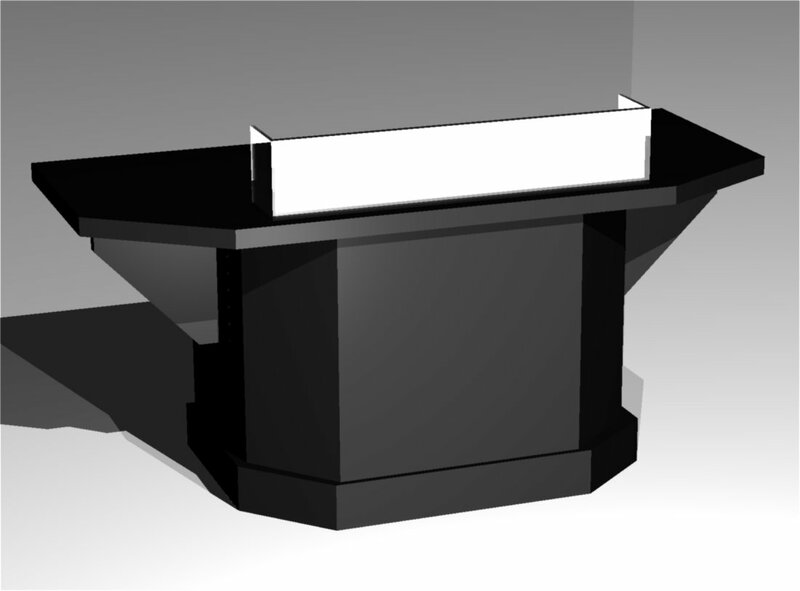 Contact us for more renderings and photo's of the designs that have been assembled in the real world by us. Each image can be clicked for a larger view, and these are just a few samples to share. Discounted rates are applied towards all new concepts and designs by default simply because they add onto our range and portfolio to add onto our lines. Being free like this without worry of an upcharge due to deviating from our regular lines, it's encouraged for our clients to to dream up new ideas and it's applied without the usual restrictions or penalties, "Out of the box requests included!'. We can do what others would find too difficult, impossible to simply unrealistic based upon their capacity, sophistication and scale. This is one concept that was recently conceptualized to maximize form and function in many ways for the clients and operator. 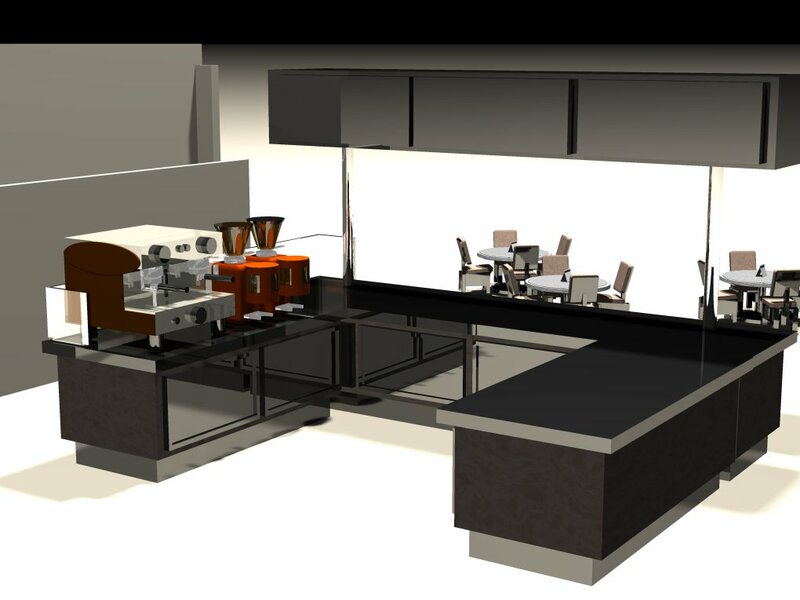 The barrista having everything within easy reach to the servers being able to distribute and assemble within one self contained platform makes this not only a highly efficient unit, it also get's peoples attention with the styling. This is the ultimate work station that can be portable as well as stationary. 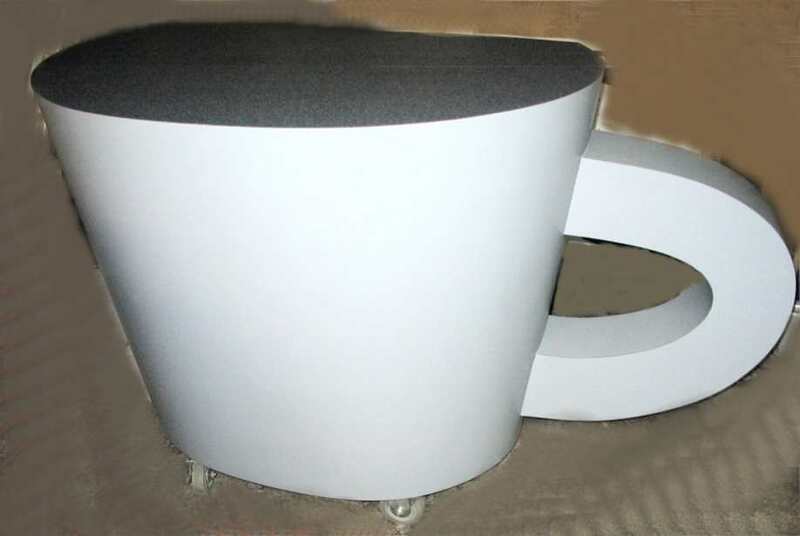 The extra condiment and drink service area in the front of it also creates additional sense of style yet it's very practical and functional to be incorporated with it. 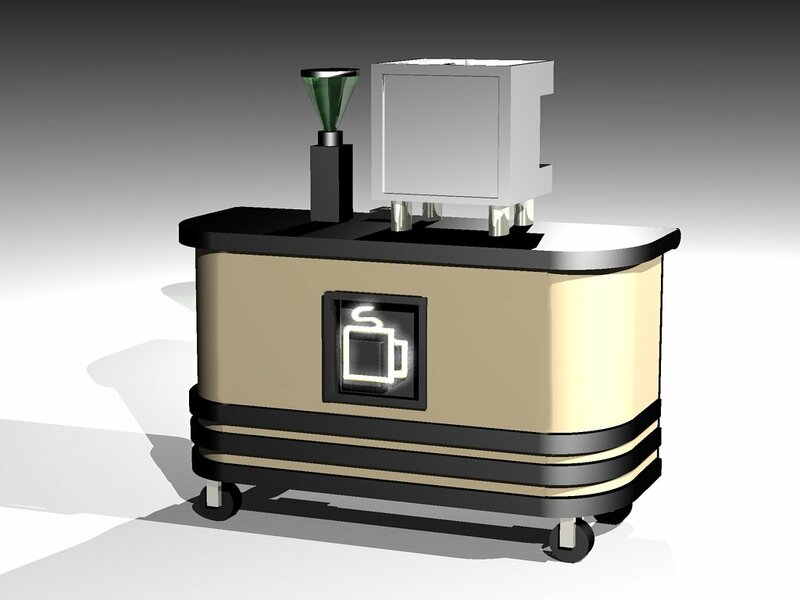 This is a more angular design, dubbed the Stealth Espresso Cart. 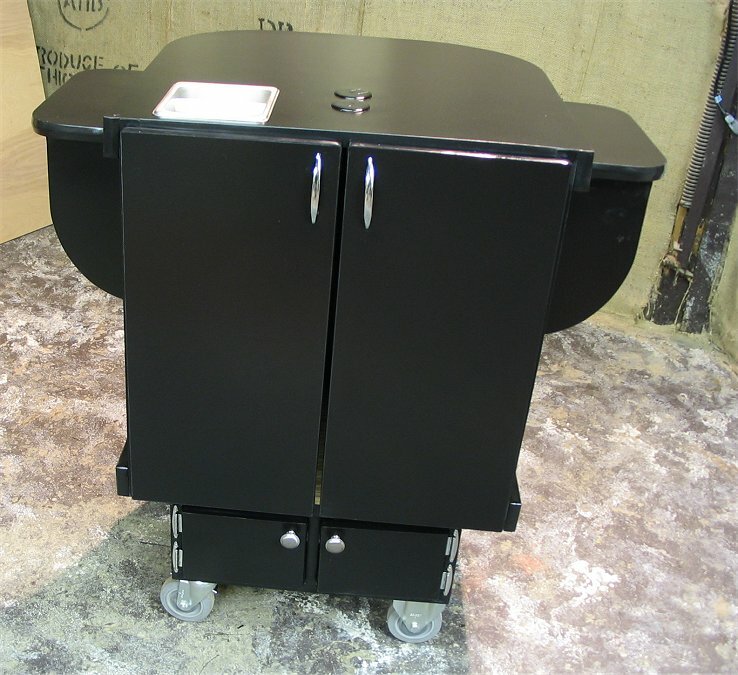 It has a stealth fighter type of look to it and an under counter slide out 3 compartment sink cart has already been built in the past based upon this design system as shown. 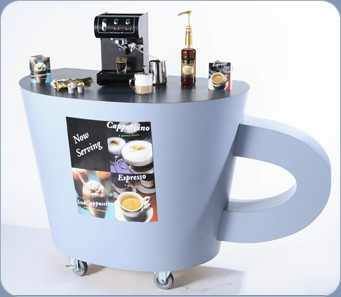 The coffee cup espresso cart is an original concept that pushed the boundaries a bit along form and function with the prototype shown. 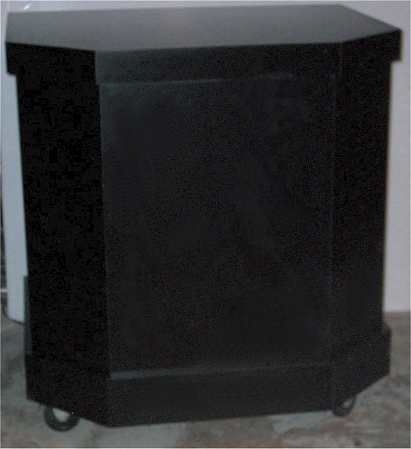 This is not merely a display model piece, it's fully self contained plumbing compliment to include an under counter hand sink, 2.5 gallon water heater, FloJet water pump, 5 gallon fresh water tank, 7 gallon waste water tank all connected appropriately... This is a full service self contained catering and espresso cart that stands out on it's own in a unique manner in an unprecedented manner. This space age design is another creation that made it into the real world with some revisions from the laminate color choices to it's scale and dimensions. Taking a more conservative approach in design, the added touch with the brass foot railing and recessed paneling gives this a more classical look. 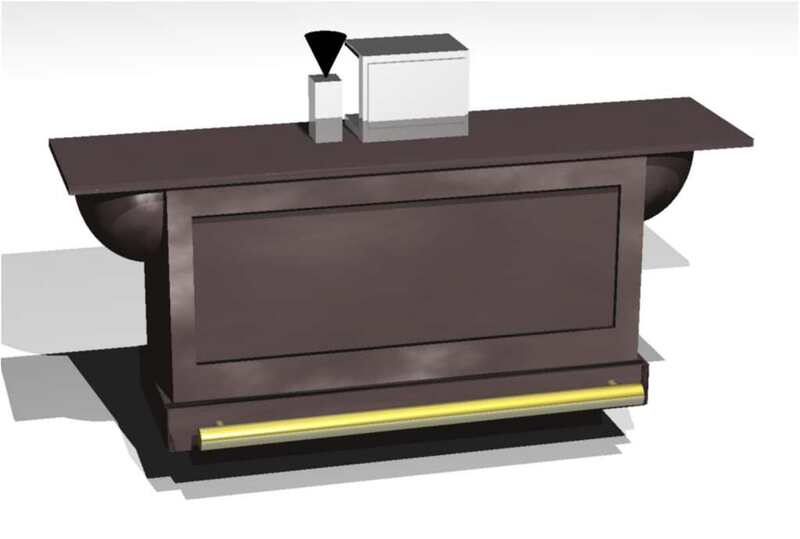 Brass railings shown have been incorporated in the Espress Outfitters lines decades ago. A clean and modern look in design that has a unique appeal which stands out on it's own. 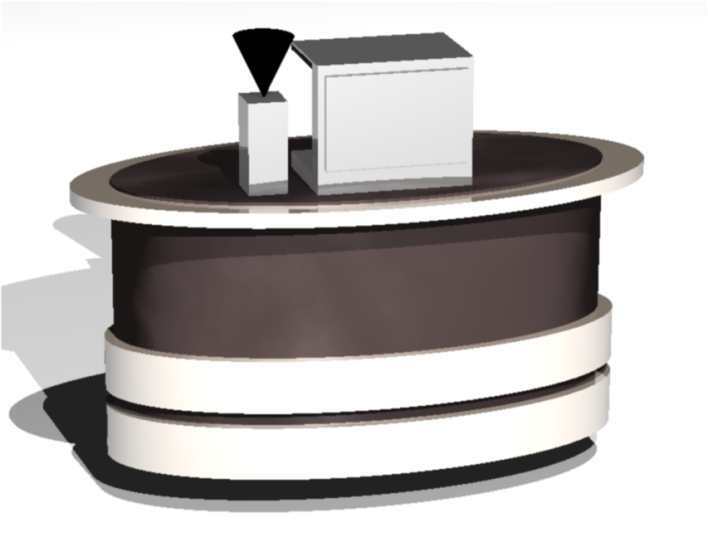 The curved system is inviting and appealing along the visual, it is designed for natural smooth flow along use for the customer and operator. Taking a step back to the conservative, natural woods and earth tones can make for a very pleasant and warm setting for your espresso cart. This one shows a condiment shelf that can be incorporated in it's real world version which has been created prior. A custom food service display cart and refrigerated pass through system, decked out in aluminum, stainless and/or chrome is a nice added touch. We have an 8 foot version of this with a high end commercial refrigeration incorporated upon it as well. 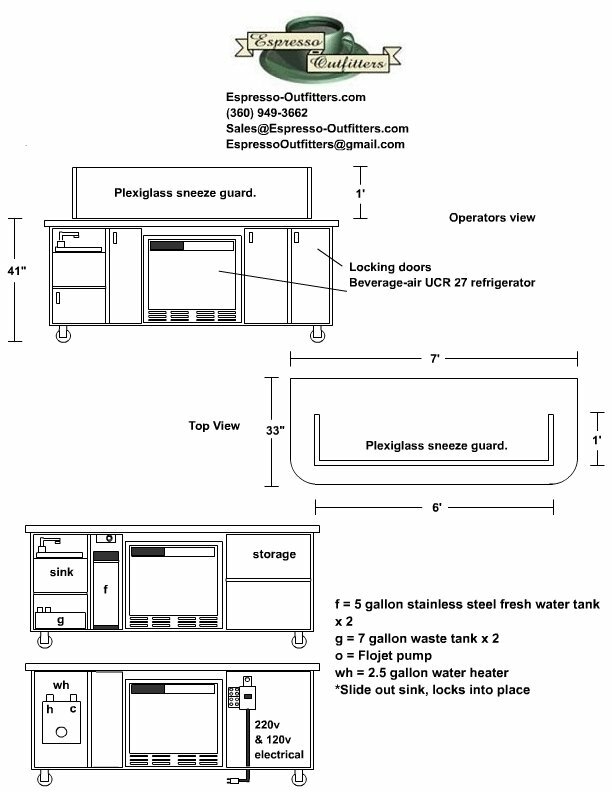 The plumbing configuration is under counter in this design as is common with most of the espresso and food service carts created. A reminder here, if there is a sink or series that also means the full plumbing compliment as well to include pump, water heater, fresh and waste water tanks and all of the plumbing lines and fittings, fully integrated within. Kiosks are the natural evolution of a retail and food service concession. This is a modular format shown, steel framed along with a permanent base rather then wheels, this design is meant to last forever. 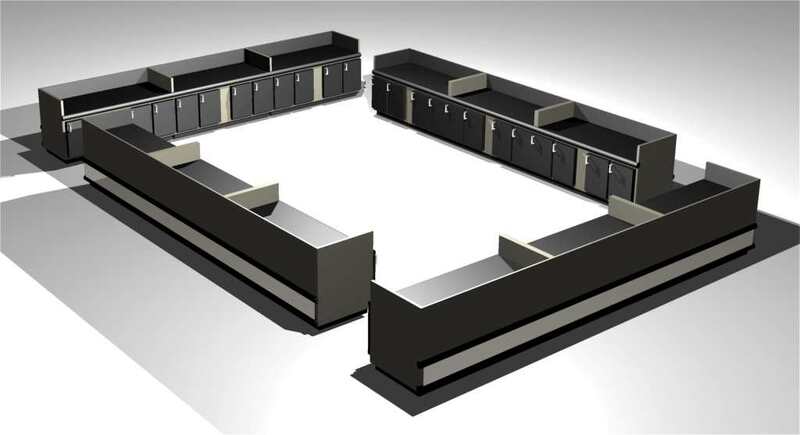 The modular 6 foot units can be reconfigured easily and in this pattern make for a serious retail concession. 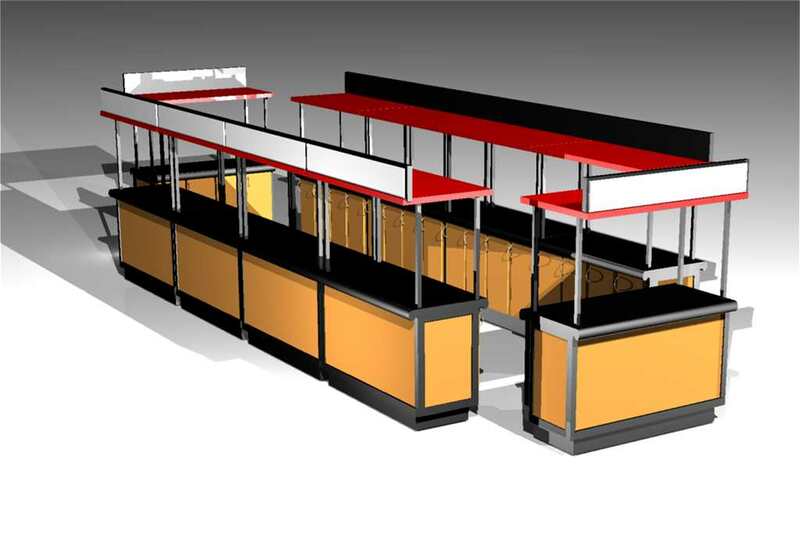 An example of a serious work station that can be used for a wide variety of retail and concession. This gives plenty of room to move around with the operator. 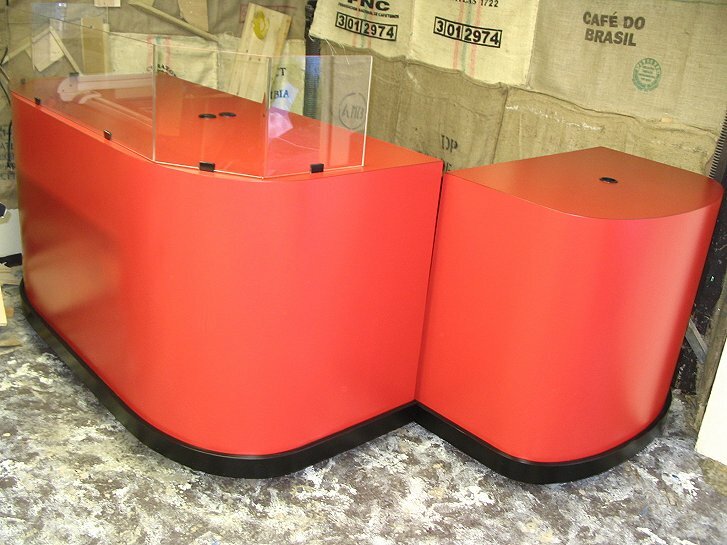 This type of kiosk system has been created in the past earlier by Espresso Outfitters and it has it's appeal unto itself to this day. The beauty behind how a modular construction set up is, you are really only needing to reproduce one or at most a couple pieces to fit together and add onto them as it's necessary and when you can justify expansion. 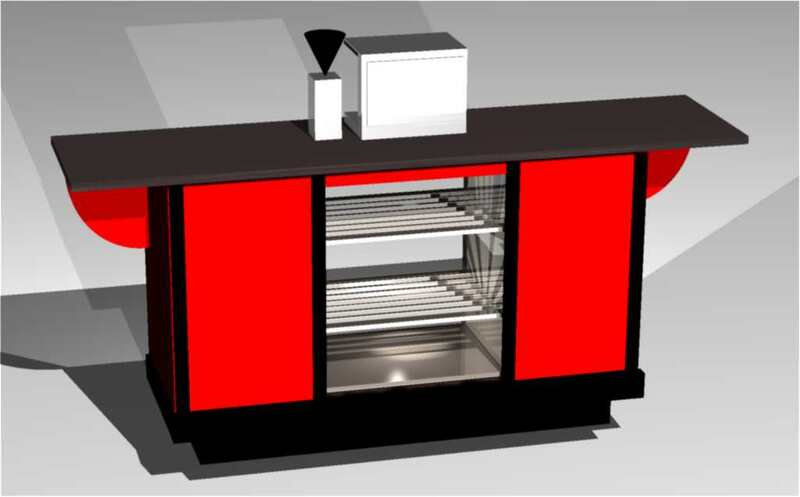 This mini kiosk design has a modern approach and can facilitate a wide variety of food service and retail concessions. Shown are a few in position for a fuller effect and to show what they would look like in series for people that want to set up their own farmers market style retail setting. 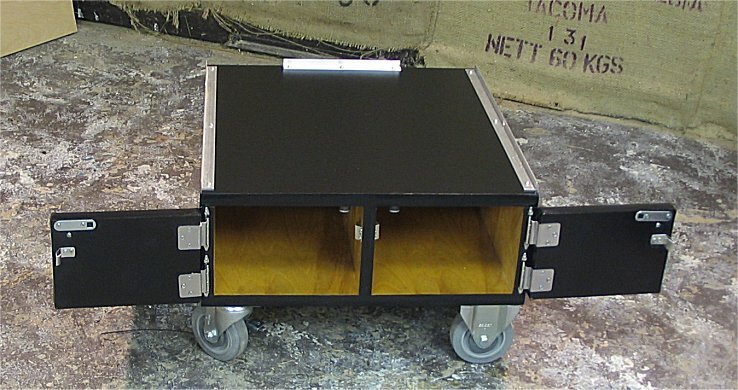 A unique, easy break down small catering cart. 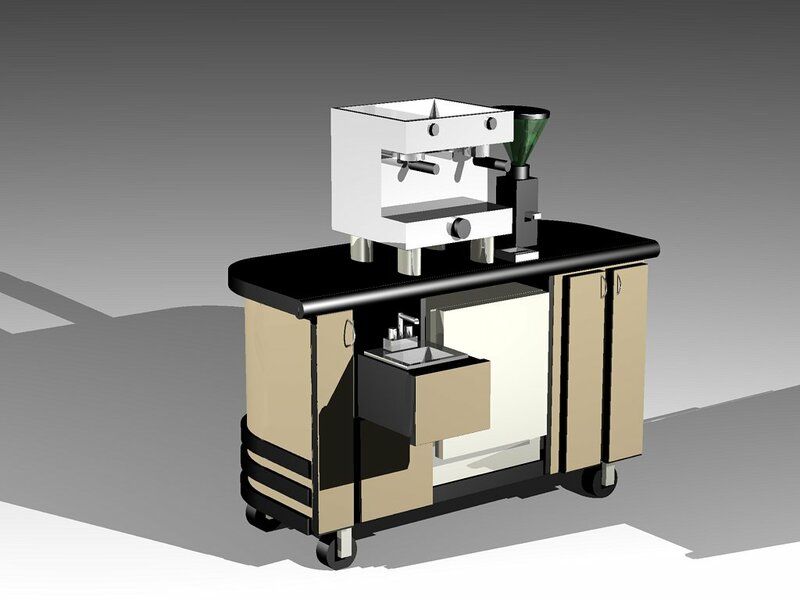 This out of the box concept catering cart was designed for the ultimate in portability. The top section and the lower can be seperated for easier transport. 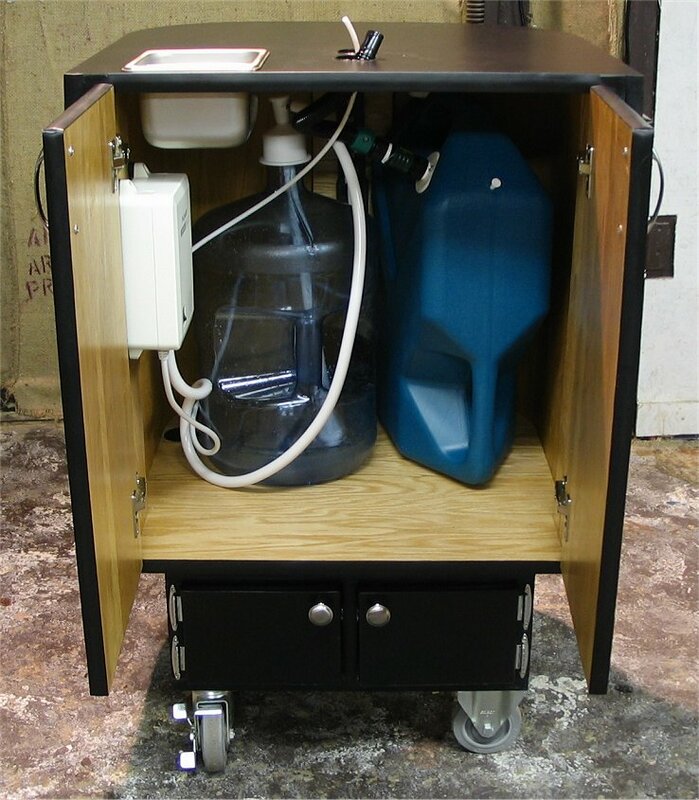 Fold down side wings and a self contained plumbing compliment to include a FloJet water pump, 5 gallon fresh water tank, 7 gallon waste water tank and also has a recessed knock box. 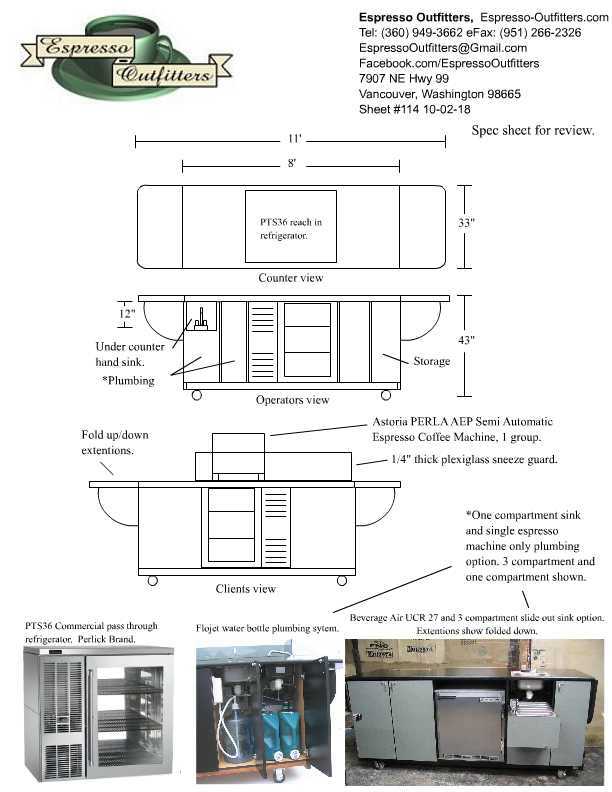 This is also the ultimate home espresso cart that exists on the market for those that are wanting a more dedicate set up for making coffee and espresso at home. 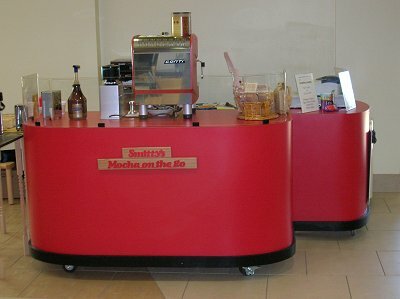 A conservative kiosk is shown in a cafe style setting. The upper storage section doubles as signage for the customers view. 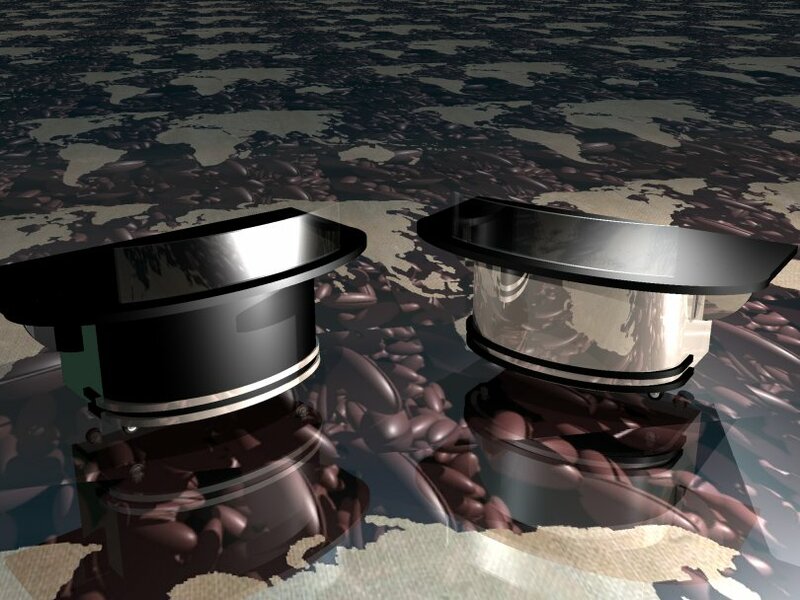 This shows a bit more along the background as well with the tables and chairs, something Espresso Outfitters can also supply and manufacture as well. 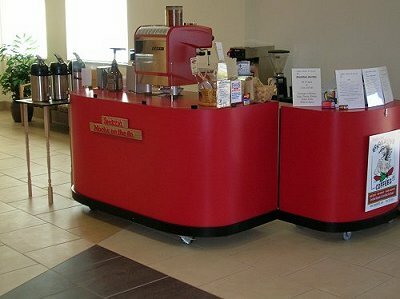 You have likely seen the stock brushed style aluminum surfacing on some of our espresso and food service cart lines. We have worked with copper and brass as well and pioneered using it in this field in the 90's originally. 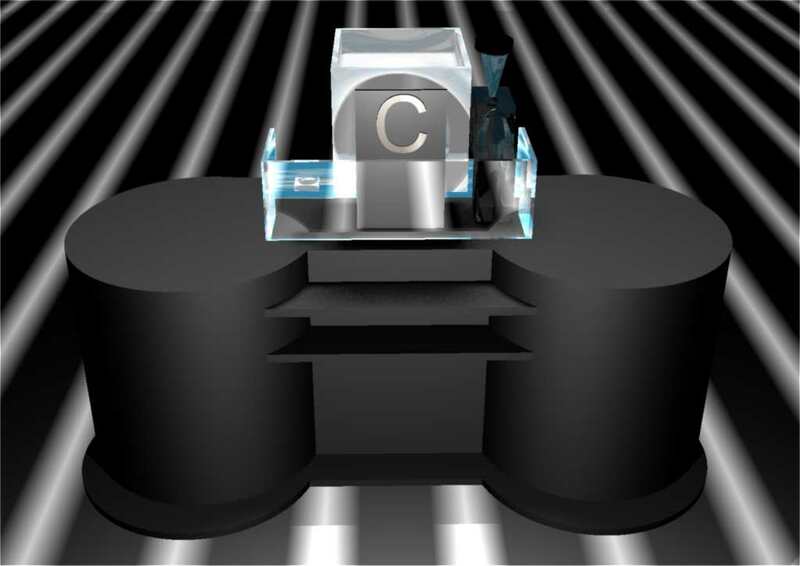 The metal surfacing that is used can be polished to a chrome like finish to really make the cart or kiosk stand out. Showing a rendering along with some creative liberty for the flooring of it to give people a better idea as to how dramatic of an effect it can be. 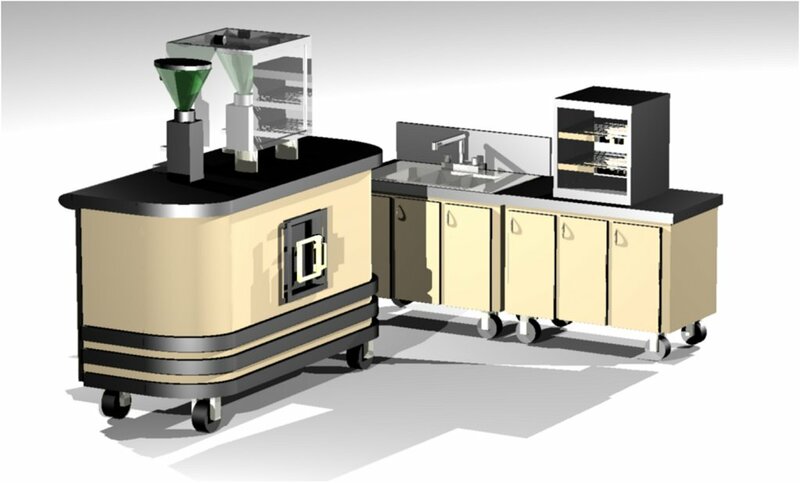 A bit less of an innovation of design espresso cart wise for our standards to show case here on that level, the business plan from the client is an amazing concept and it's shared here with both because both are note worthy in combination. 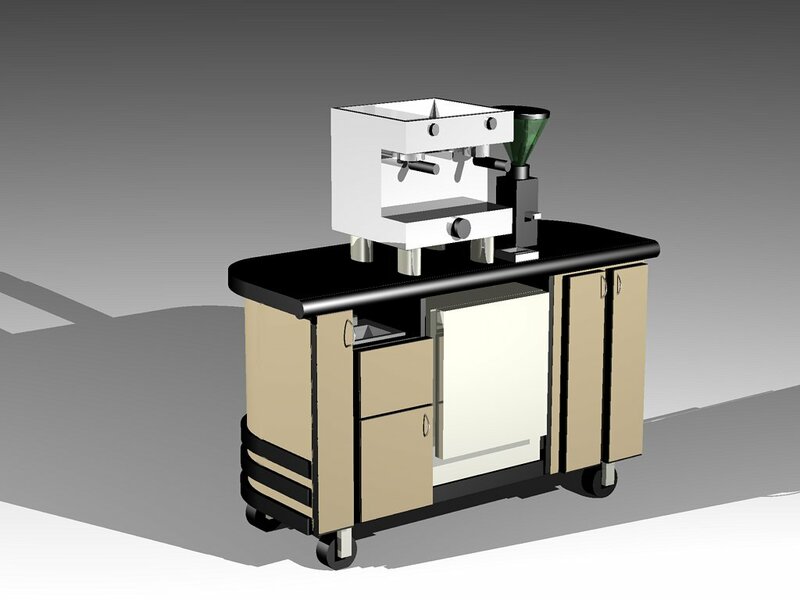 The concept utilizes the 6 foot base espresso cart and 3 foot side cart with some added trim. Their equipment choice matched things nicely as well. Setting up shop, getting all of the details worked out, then reselling it a couple of months later makes for a lucrative combination for all parties. Many people are overwhelmed with the process of setting up shop, others have the capacity to but little time nor desire to manage a set up like this. The latter comes out ahead by making sure everything is ready to go and running perfectly, easy transition into running their own cart. The seller marks it up to compensate for their time and it's a quick investment and return upon they get to set up more in the future and do the same as they desire. This approach opens the doors for those that want to be part of it, get in and out relatively quickly with a nice return as well as those that want to set up shop easily with all of the details covered, operational so they have little to do but hold onto the reigns of things similar to a franchise without the restrictions. Espresso Outfitters extends the same support regardless of which hands are exchanged ownership wise for their wares and building. What is also good for the buyer, they are buying something that's new, fresh, and they get to make it their own. That initial impact with it's set up is wonderful, putting your own personal touches to it and making it flourish gives them a great sense of accompolishment. 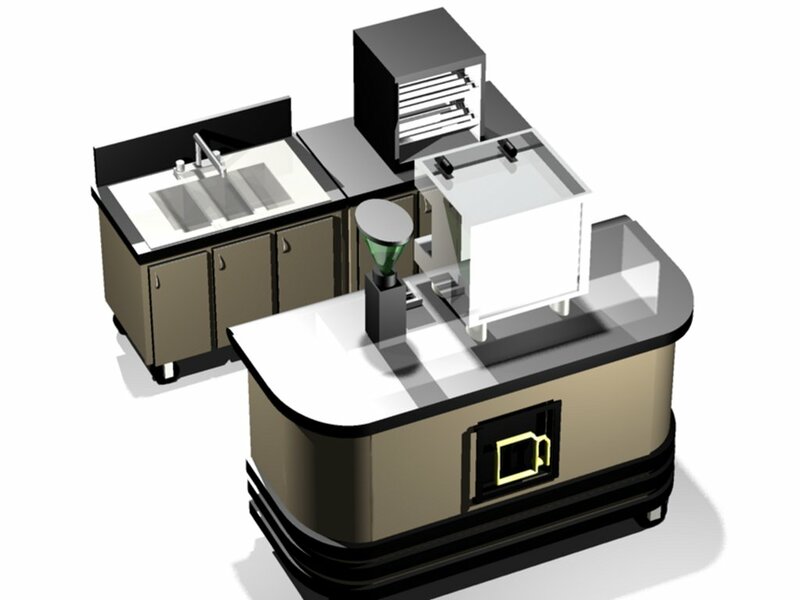 The above concept cart and 3 compartment sink cart and storage cart with the counter display refrigerator is a great mobile kiosk. The neon sign built in is a serious presence and not simply some decoration. This is a combination of a few lines with some creative add on's that form a versatile and over the top along form and function. 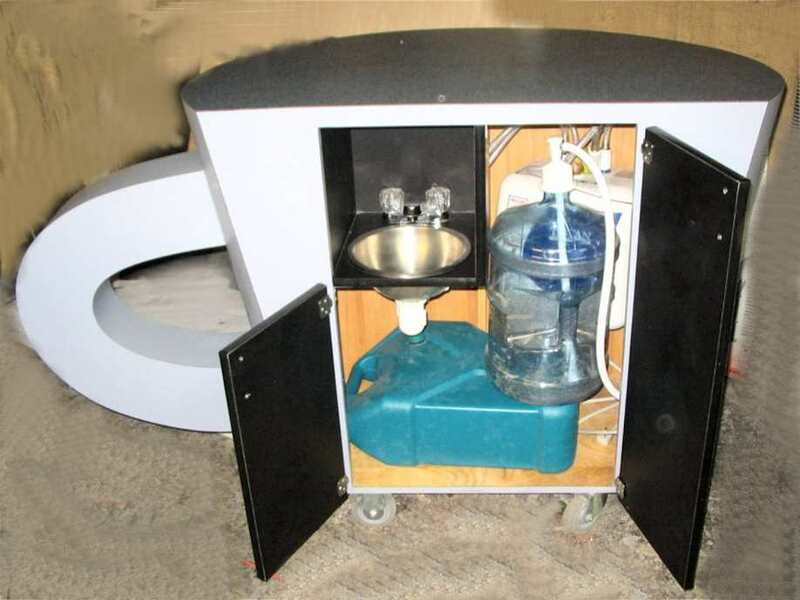 The plumbing for the main unit along with the three compartment sink cart are fully self contained. Added feature such as the slide out sink is convenient as well. This design has been fully detailed and is going into production soon.